Ok, it’s another late Thrifty Thursday… Happy New Year by the way! When I first heard the idea of the Thrifty Thursdays, I immediately started writing down different ideas that I had to share. Then, being my crazy, list-making self, I organized the list into monthly categories. For the month of January, I originally thought I’d focus on Budgets and eliminating bills, since it was the new year, but I’ve had lots of questions from friends recently about one specific expense: cutting the grocery bill. So you’ll have to hold on for the budget stuff I guess… I’ve moved up my May topic to this month: Meals, Menu Planning and Marketing. There are a lot of factors in keeping this particular bill down. A lot. Sometimes I only take cash to the store, so I CAN’T go over budget. Some of the burden is relieved by Rick hunting for a lot of our meat, or buying meat in bulk. In the summer, the garden helps immensely (and you can bet you’ll see more about that one too). But I know not every family is part of a CSA, or hunts, or gardens. So the tips I’ll focus on this month are ones that every family can use. This week: Menu Planning! I usually plan a month of meals at a time. I know that it can seem overwhelming to a lot of people to do that… even planning for the week is hard for some people. But I do think planning for the month cuts the grocery bill a lot for us. First I’ll share what I do each month, and then why I think it works for saving money. That whole chicken buried way in the back. Oh, look, a couple of tilapia fillets I forgot about. When did I buy bratwurst? Well, add it to the list. Pork roast, enough for two dinners. Then I inventory the cabinets for grains (how long have I had that rice??) and whatever veggies I have, frozen, fresh or canned. Next, I open up Excel, to a saved monthly menu I have. I’m happy to email this to anyone who asks for it! I change all the dates for the upcoming month and either I start typing in meals or I print it and hand write them in (or a combination of the two). The first items I add to the menu are, unsurprisingly, the things I found in the inventory. I think this is a lot easier then starting from scratch. It’s a good jumping off point, and it guarantees that my grocery bill will be lower in the first couple of weeks when money is tighter for our family, since I’ll have to buy less. Each time I add something to the menu that was on my inventory post-it, I cross it off the list so I don’t accidentally add it twice. Also, I usually try to do one meatless meal a week, and one left-over meal (or a cook once, eat twice meal, as I’ll explain). Once I get through the inventory or if I have a lot of something in particular, let’s say pork, for example, I will pull out a couple of my “go-to” cookbooks, past menus I’ve made, and a few favorite websites. These help with the ideas, and keeping things fresh and from getting boring. My “go to” cookbooks are: Glorious One-Pot Meals by Elizabeth Yarnell, and my new fave, Everyday Food: Great Food Fast by Martha Stewart Living. More about these at the end of the post. A good website to check out, especially if you are a beginner at the menu planning is Woman’s Day Magazine’s site. They provide a Month of Menus each month, along with shopping lists, and cooking instructions for many of the meals, all posted in one place on their site. It’s a good starting place. I wouldn’t recommend using their menu as is if you’re really trying to save money, because I don’t see much savings when I look at the grocery lists, but it’s a good place for new ideas if you get stumped. Anyway… blah blah blah, fill in all the squares of your menu. Then, comes the shopping. I use what I have first, easing the grocery bill during the first weeks of the month. Most grocery stores have what you need on sale at least once a month. You can look ahead, and if something you need later in the month is on sale this week, you can buy it cheap. If there is an amazing sale, or if I make a trip to Costco, I stock up on the good deals. This provides the jumping off point for the next month’s meals. The rest of inventory for the next month comes from any meals I was too lazy to cook the previous month (hey, we all have those days, right). The last piece is the meatless meals and the left overs (cook once, eat twice). Meatless meals are less expensive. And they are faster to prepare… great when you have plans in the evening or get off work late. With a little practice and some spices, your family won’t even mind one vegetarian (think spaghetti and a big salad with fresh mozzarella) meal a week. I promise! The left overs, or the cook once eat twice meals work like this. Everyone deserves a night off, even you. And if you’re like my family, that doesn’t mean ordering a pizza, since pizza money isn’t always in the budget. So let someone else do the cooking one night a week (it’s usually Friday or Saturday for us). Reheat the left over soup from Wednesday, or when you make pork roast on Tuesday, make a little extra to shred for BBQ pulled pork sandwiches on Friday. Left overs don’t have to be the same meal twice. Use the left over roast chicken to make chicken salad. Be imaginitive. I especially love this in the summer… cooking once for two meals means one less day with the stove on. We don’t have A/C, so that’s important! If you are not bored (or full) yet, keep reading. I wanted to take a minute to share why Glorious One-Pot Meals and Great Food Fast are my go-to cookbooks. Both books use fresh, wholesome ingredients. No condensed soups or pre-packaged foods. In other words, they are healthy. I know people who are not used to this kind of cooking might think it’s more expensive to buy fresh, non-convenience foods. Well, it looks that way on the surface, yes. But, if you look at the true cost of what you’re eating, you might change your mind. But that is actually a whole ‘nother Oprah for me. Another reason I like these books are because they are convenient. 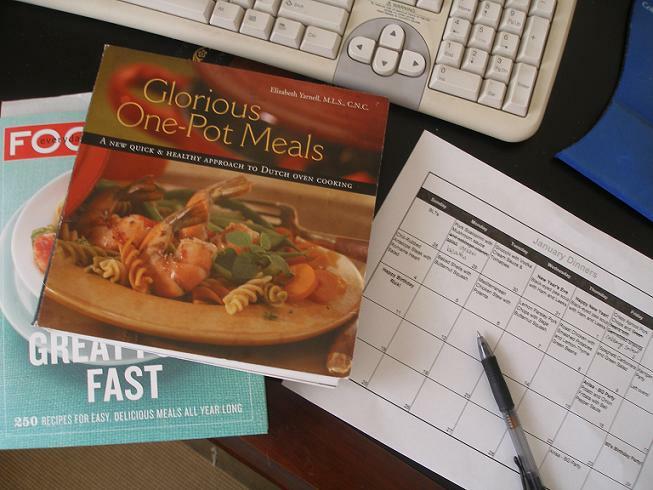 The Glorious One-Pot Meals book is somewhat self explanatory… one-pot. Less dishes. And I use a big pot and usually double the recipe, which gets me left-overs, good for another dinner or at least two lunches. It also uses whole grains and lots of veggies… both of which are always hard to get enough of, so it helps me remember to do it! The Great Food Fast book has prep times listed on every recipe. And it is arranged by season. This is important because food is less expensive and more nutritious when you buy it in season. So in January, when I’m stumped with what to put on the next menu square, I can flip through the winter section and know I’ll find a meal that is healthy, not expensive, and all the ingredients will be there in the grocery store. Be sure to check the other blogs for more Thrifty Thursday tips! And if you decide to join in, just let me know… post a comment already! I’m excited to get to meal planning. I did great when we were in Little Rock, but now we’re settled I can do it again. I did notice with meal planning, we bought less food overall, ate less snacky foods and it removed the stress of “what do you want for dinner?”! Thanks for the tip! Hey there! I was at work the other night and we were all printing off calendars and doing meal planning! How funny!! I would love a copy of your excel sheet though since your so nice and willing to share. I’m crazy computer organized so I think it would help a lot. Thanks! !